YOUNGSTOWN Funeral services will be held on Saturday June 30, 2018 at 10:30 AM at the Kelley-Robb-Cummins Funeral Home for Lucile C. Sturdevant, 96, who died Monday June 25, 2018 at Crandall Medical Center in Sebring. She was born August 21, 1921 in Youngstown, a daughter of Ralph H. and Edna M. Gilbert Tooill and was a lifelong area resident. Mrs. Sturdevant was a member of St. John’s Episcopal Church in Youngstown and was a member of the Episcopal Church Women. She was a credit manager for Spiegel and formerly was a catalog clerk at the Mahoning County Public Library for 15 years, retiring in 1970. 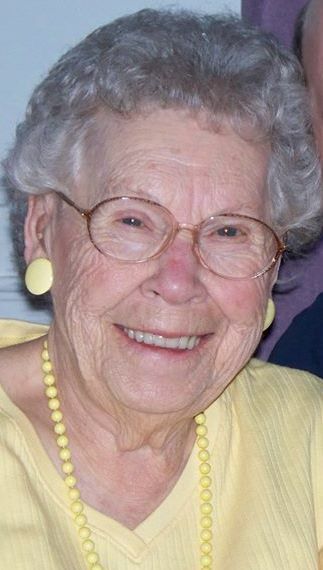 She was a charter member of the Congress Lands Chapter Daughters of the American Revolution in North Canton and the Daniel Cooper Chapter of the Daughters of the American Revolution in Dayton. Her husband, Carl H. Sturdevant, whom she married June 18, 1941, died March 18, 2009. She leaves a daughter, Carol L. (Jonathan) Flowers of Miamisburg, OH and 2 grandchildren, Heather Flowers of Cleveland and Attorney Kevin S. Flowers of Los Angeles. Lucile was preceded in death by her parents; her husband; her brother John Tooill and 3 sisters, Irene Johnson, Mary Belle Murdock and Clara Belle Smith. Family and friends may call on Saturday June 30, 2018, one hour prior to the funeral services from 9:30 AM to 10:30 AM at the Kelley-Robb-Cummins Funeral Home. Interment will be at Lake Park Cemetery.